I chose this novel for my book group to read and it achieved the rare feat of being a book we all really enjoyed! It is the 1920s in New York and on the face of it beautiful socialite Mrs Theresa Williams has a perfect life. Married to the wealthy, much older Sylvo, they turn a blind eye to each others extra-marital affairs, as divorce is scandalous. 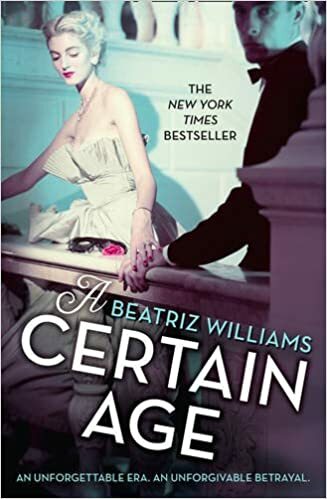 A Certain Age follows the relationship between Theresa and her younger lover, the splendidly named Captain Octavian Rofrano. When Theresa’s brother Ox wants to marry young Sophie Fortescue, Octavian is enlisted to carry out the family’s tradition and take the heirloom engagement ring to Sophie, asking the question on behalf of Ox. He is also tasked with checking into the family to make sure there are no skeletons lurking. And of course, there certainly are! Handsome Octavian and beautiful young Sophie find they are attracted to each other yet neither is in a position to act on their feelings. Interspersed with the story are breathily excited newspaper gossip columns written by Patty Cake – a pseudonym for someone whose identity is revealed near the end – as she reports on ‘the trial of the century’ which involves many of the characters in the book. This was a steady paced story where the secrets are gradually revealed. Often the reader gleans more from the newspaper articles, as they fill in much of what the characters don’t tell. This was a glamorous time with the beautiful clothes and the high society parties seeming so decadent. Think Downton Abbey transported to New York and you have an idea of the clothing styles and also of the changes society was undergoing. I enjoyed reading more about what scandals were going on and what secrets the characters were hiding. A elegant novel with secrets, romance and a murder mystery at its heart. There were some dramatic scenes near the end bringing the murder mystery element of the story to a conclusion together with resolving the love stories of the main characters. There seems to be potential to carry on the stories of some of the characters after this book ends and I’d particularly like to know more about Theresa and Virginia. As the freedom of the Jazz Age transforms New York City, the iridescent Mrs Theresa Marshall of Fifth Avenue – a beautiful socialite of a certain age – has done the unthinkable: she’s fallen in love with her young lover, Captain Octavian Rofrano, a handsome aviator and hero of the Great War. But though times are changing, divorce for a woman of Theresa’s wealth and social standing is out of the question. Divided loyalties and dangerous revelations lead to a shocking transgression and eventually Theresa must make a choice that will change them all forever.